When shopping for cushion diamonds online or at your local jeweler two very important factors need to be considered: the length to width ratio (square vs. slightly rectangular vs. rectangular) and the faceting (cushion brilliant versus cushion modified brilliant). While most customers have a preference as to the overall shape that appeals more to them, many buyers do not understand the differences between the faceting of cushion brilliants and cushion modified brilliants. Originally, cushion cut diamonds were cut using step facets, where the facets are elongated and placed in rows to simulate a mirrored staircase. Marcel Tolkowsky pioneered the modern round brilliant cut diamond by cutting facets perpendicular instead of horizontal (facets that resemble triangles) and found that this produced more brilliance and fire from the stone. These angles were incorporated into the cushion cut to give it more sparkle while keeping the outline of the diamond the same. Thus the cushion brilliant diamond was born. Cushion brilliant diamonds have very similar faceting arrangements as round brilliant cut diamonds. The facets in the pavilion of a cushion brilliant extend from the center of the diamond out toward the girdle (outer edge), resembling a star. Cushion brilliants contain larger facets and do not have a “crushed ice” look. Rather, they resemble the appearance of round cut diamonds with a pillow like or cushion shape – which makes them so desirable and popular. Cushion modified brilliants are a variation on the original cushion brilliant shape. This type of cushion cut contains an extra row of facets just below the girdle, where the facets on the pavilion do not actually reach the girdle, resembling a flower shape. 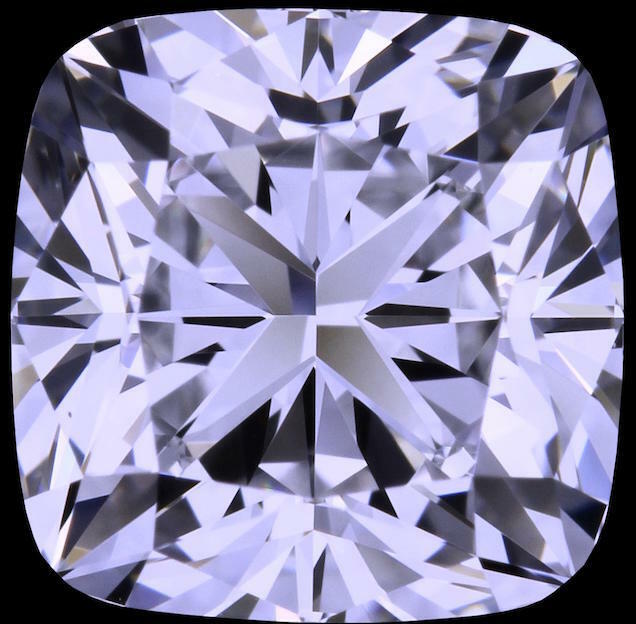 Cushion modified brilliants often have exceptional sparkle reminiscent of the “sparkling water” or “crushed ice” appearance of a well-cut radiant shape diamond. Furthermore, because there isn’t a large demand for this particular cut and cutters save more weight when cutting them from a rough diamond crystal, they are less expensive than traditional cushion brilliant cut diamonds. 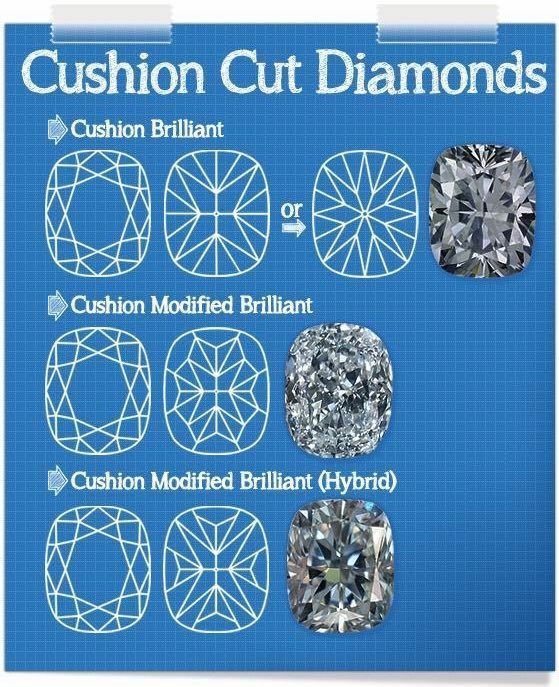 A third technique was created by diamond cutters to marry the appeal of the cushion brilliant with the brilliance and scintillation of a cushion modified brilliant. Technically still labeled as cushion modified brilliants, we like to call them hybrid cushion brilliants. These diamonds contain four pavilion facets that extend from the center of the diamond out toward the girdle, like the cushion brilliant, but with modified facets in between them. These additional facets provide more sparkle and fire to the diamond while the top of the diamond still features larger faceting like the brilliant round cut. 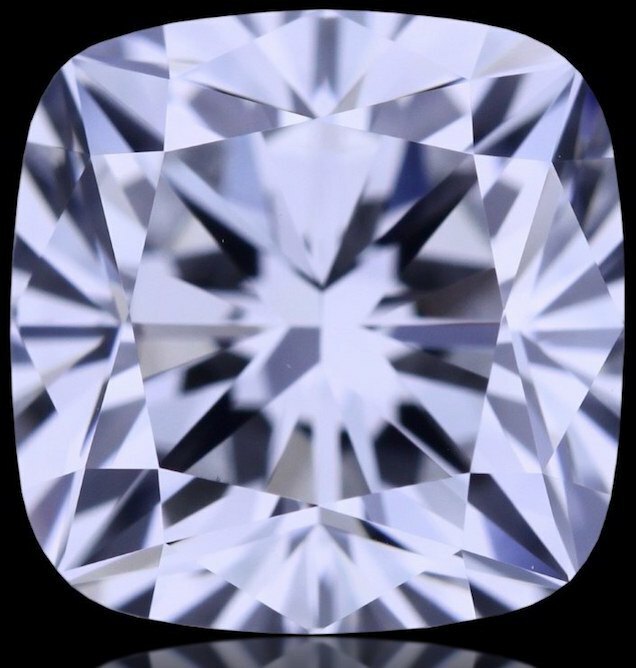 With this cut, diamond cutters are now able to create cushion cut diamonds that retain the carat weight and appearance of a modified cushion with the look of a classic cushion brilliant. Below you will find a diagram to help you identify cushion brilliants from cushion modified brilliants. If you are currently shopping for cushion diamonds start your online diamonds search now by going to Brilliance.com or contact a Brilliance.com Gemologist by calling 1-866-737-0754 for assistance.